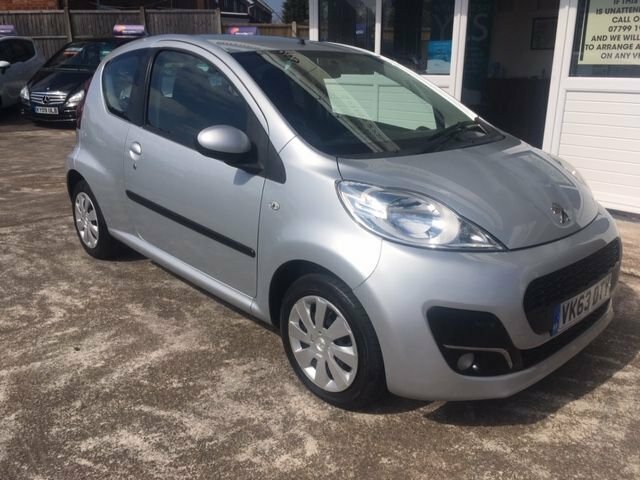 Previously Sold and Serviced by ourselves, this delightful 2013 Peugeot 107 Activ is a low mileage, low tax, low insurance little beauty - finished in Mercury Silver Metallic this 3dr hatchback has CD/Aux, Air Conditioning, Electric Windows, Power Steering, 5 Speed Gearbox etc etc - It is in immaculate condition and is an ideal 1st car...!!! Only covered 34,000 miles since brand new...!!! For drivers who require a compact, practical city car that is affordable to run and plenty of fun to drive, the Peugeot 107 could well be the answer. Based on the same chassis as the Toyota Aygo and the Citroen C1, it's designed to make short work of narrow urban streets and tight parking spaces and is exceptionally easy to drive. Come to BJH Motors and Sons to test drive one of our used Peugeot 107 models for sale in Worcester. All of our used vehicles come fully inspected and a member of the showroom team will be more than happy to discuss your requirements and ensure you track down the right model to suit your needs.